Machines are, in theory, designed to be efficient, convenient, non-intrusive. They blend into our environments seamlessly as non-threatening and often aesthetically pleasing tools. Machines are everywhere: a ubiquitous part of the enhanced environment. Some are autonomous, while others are tightly coupled with the human body: prosthetics, communication devices, even jewelry. This gentle encroachment, combined with ongoing research toward machine sentience, forces us to consider machines outside the context of mere tools. They are part of our social, emotional, artistic, and even spiritual context. 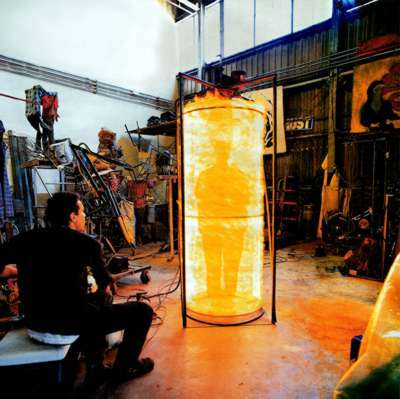 California has been ground zero for extreme machine art and robot performance. The combination of Silicon Valley and Hollywood, plus a technically skilled volunteer pool, plus decommissioned military bases and piles of discarded equipment, has created a fertile breeding ground for a virulent mechanical 'arts and crafts' scene with a hacker ethic. Emerging technologies such as augmented reality, increasingly versatile and robust sensors and actuators, computer vision, artificial life, and virtual reality are appropriated and subverted by these artists in order to experiment with alternative scenarios for extreme human-machine interaction. 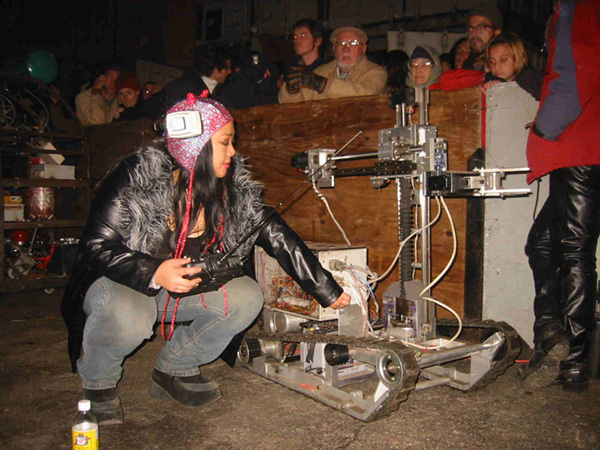 This month at Zero One, Karen Marcelo and Maribeth Back present The Art of Extreme Robotics. The featured artists explore inter-machine and human-machine interactions through robotic art and performance. The visceral immediacy of their work in extreme machine conceptualization, creation, and operation encourages us to re-examine the integration of machines in our own lives. Kevin Binkert discusses the intersection of creativity and commerce. Kal Spelletich will describe and demonstrate participative robotic art. The audiences at Seemen performances volunteer to operate and interact with the work. It is a thin line between scaring them off and winning them over. They become the hero/star of the show for they are the ones who conquer their fears and perform acts of superhuman endurance and fearlessness in front of a live audience. This puts us in touch with rituals and events that validate and affirm existence using technology, fear and the realization that there is something more important than this fear. Kal Spelletich attempts this in a fun conceptual way. The barrier between passive audience and art(ist) is shattered. This is a project to explore new forms of interpersonal communication through touch and interaction (Force-feedback technology), Intimacy and social interaction via technology. Kal has conducted over a thousand such experiences with willing volunteers. Eric Paulos and EIU, as developers of the first privately owned electromagnetic weapon and anonymous biological pathogen dispersion system, reaffirm their dedication to researching the most vital elements of future human interaction systems. Their expertise, knowledge, and rapid adaptation skills have been deployed in an effort to design new systems and tools to combat and intimately connect with the future. Challenging times bring new urgency to these parlous projects which will be discussed tonight. Mark Pauline gives a talk full of contemptuous ridicule for the notion of Technology as an alienating force, combined with an unreconstructed epiphany on blind allegiance to total technical immersion. Kevin Binkert and Flame Tornado Kevin Binkert is a San Francisco based inventor, machinist, pyro-expressionist. At age three he stuck a key into an electrical outlet. 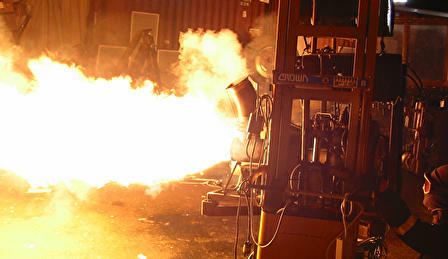 More recent experiments include: breaking the sound barrier with the mind shattering roar of 460 V8 powered Spinner which put the Austrian air force on red alert during a machine performance at the Steirischer Herbst Festival '92; the creation of a 40 foot tall Flame tornado; and numerous mechanical/explosive collaborations with Survival Research Laboratories in the US, France and Austria over the past 12 years. 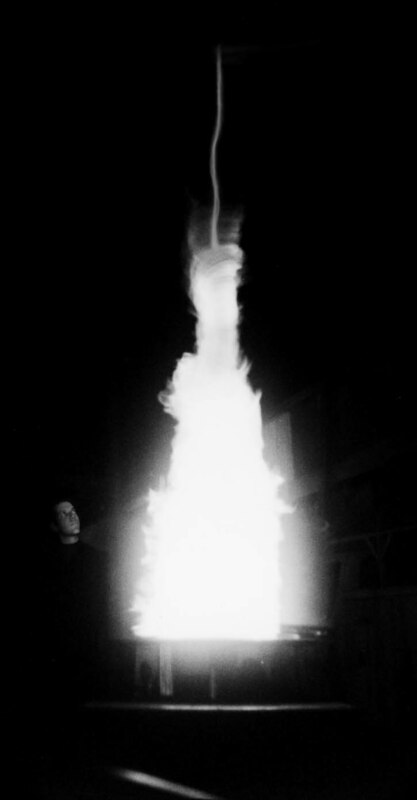 Binkert has operated his Flame Tornado machine in numerous solo shows in San Francisco and across America. He is currently a Spirit of America land speed record team member. During his time with the SOA team, he designed and built many of the systems onboard. On 10/96 the 45,000 horsepower jet car streaked across the Black Rock desert at 677 mph. 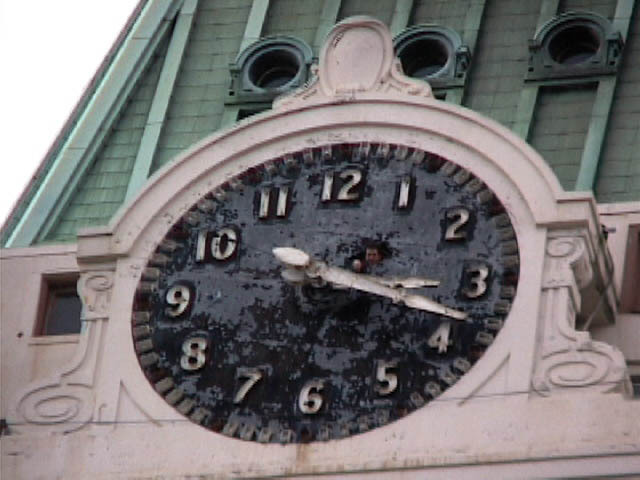 Kevin is currently the owner and operator of Standard Metal Products (SMP), a San Francisco based machine shop engaged in diverse jobs such as medical and dental instruments, movie props, unsafe toys, railway trains, public water safety devices, aircraft, and the restoration of the 1915 Clock Tower mechanisms in the Oakland Tribune. He recently escaped town for a brief stint as an ape in a burlesque show. Eric Paulos and PRoP (Personal Roving Presence) Eric Paulos received his PhD in Electrical Engineering and Computer Science from the University of California, Berkeley. His research, scientific, artistic, and social interests revolve around robotics and internet based telepresence, particularly the physical, aural, visual, and gestural interactions between humans and machines and various permutations of these interactions. In 1996 he founded the Experimental Interaction Unit (EIU) to directly address concerns and topics in this area. EIU developed the I-Bomb, the first privately owned electromagnetic weapon system and soon after Dispersion, an anonymous biological pathogen vending machine (soon to be consider a crime under California Assembly Bill #74 2002). He has developed several internet based tele-operated robots including, Mechanical Gaze in 1995 and Personal Roving Presence (PRoP) devices such as Space Browsing helium filled tele-operated blimps and ground based PRoP devices (1995-1998). He collaborated to design and implement the world's first web tele-robotic laboratory called Legal Tender, that allows users to remotely examine a pair of $100 bills and experiment on them to determine their authenticity. He has also collaborated extensively with Mark Pauline of Survival Research Laboratories (SRL), to develop the first globally accessible system that provides anonymous civilians the ability to operate intentionally lethal mechanical devices over the internet. Eric's work has been exhibited internationally, including the InterCommunication Center (ICC) in Japan, Ars Electronica in Austria, SIGGRAPH, the Dutch Electronic Art Festival (DEAF) in Rotterdam, the Blasthaus Gallery, and a performance for the opening of the Whitney Museum of American Art's 1997 Biennial Exhibition, an opening event at SFMOMA, LA MOCA, Yerba Buena Center for the Arts, and an event for the inauguration of the new ZKM Center for Art and Media Technology in Karlsruhe, Germany. Eric is a founding member of the IEEE Technical Committee for Internet Telepresence and respected as an important contributor to the field of computer supported collaborative work (CSCW). Kal Spelletich Kal Spelletich was born and raised in Davenport Iowa, recently named "America's Worst Place to Live." Started working at father's construction company once I could hold a hammer all day. Ran away from home age 15 and started squatting abandoned buildings and living on the streets. Worked as a dishwasher, cook, carpenter, auto mechanic, day laborer, street scammer, plumber, factory, grocery store, salesman, teacher, carpenter, stagehand, fix it guy. At age 18 worked in United Auto Workers Union at International Harvester factory with 4,000 workers. Discovered art through a camera. Education: BA Visual Arts / Eckerd College St. Petersburg FL. 1977. Performances: Originated and developed the concept of large scale machine performance beginning in 1978 with the founding of Surviva l Research Laboratories. Staged over 50 machine performances in the US and Europe as director of SRL. The most recent performanc e was staged in Berkeley, CA on Dec. 15rd 2001. Constructed and designed dozens of large, complex robots and machines for use in t hese performances. Have trained and supervised the efforts of over 200 assistants in the art of machine performance. Teaching / Lectures, Panels : Over 180 lectures, panel discussions, and seminars at locations such as: Oxford Univ, Yale, Commonwea lth Club of SF, Stanford, Interval Research Corp., MIT, Rutgers, UCLA, Carnegie-Mellon, Stanford, Los Alamos Laboratories, SCIARC, and at numerous locations throughout Europe, and Australia. Visiting professor, 1989 spring semester, Art Institute. Television Appearances: Over 80 TV spots in the US, Europe, Australia, and Japan, ranging from interviews and video documentation sp ecials to anonymous reports of mechanized pranksterism. Publications: Over 420 articles and interviews both in print and on-line, in such publications as, Wired Magazine, NY Times, 21 C., Grand St. Magazine, Wall Street Journal, Washington Post, South Atlantic Quarterly, Parkett, Art in America, ID Magazine, Art Forum , SF Chronicle, SF Examiner, Vogue, etc. Also featured in numerous books, including Mark Dery's "Escape Velocity" and Kevin Kelly's "Out of Control". Mark Pauline has received numerous grants for his work. Survival Research Laboratories was conceived and founded by Mark Pauline in 1978. Since its inception, SRL has operated as an organization of creative technicians dedicated to redirecting the techniques, tools, and tenets of industry and science away from their typical manifestations in practicality or product. SRL has staged over 55 mechanized presentations in the United States Europe and Japan. Each performance consists of a unique set of ritualized interactions between machines, robots, and special effects devices, employed in developing themes of socio-political satire. Humans are present only as audience or operators. Karen Marcelo worked with the CSL group at Xerox PARC developing mobile code for simulated ubiquitous computing environments and recombinant computing research. Previous projects she has worked on include a VRML authoring tool, a web-based multi-user 'world' Nerve Garden which received Honorable Mention in the .NET category at Ars Electronica 1998, and a parameterized 3D visualization program (Tetrahedonism) which placed 3rd in the Science and Engineering category of the VRML Excellence Awards in 1997. In her spare time she is Tele-obliteration Engineer for Survival Research Labs, coding Internet telerobotic systems for lethal robots. Maribeth Back designs, builds, and writes about multisensory interfaces and environments. She is a dynamic systems designer and audio engineer whose work includes experimental electronic books and reading devices, mixed reality systems, sound design for professional theatre, radio, and CD-ROM; system design for virtual and computational environments; and performance installation pieces, both solo and collaborative. In 2001 she won the ID Magazine Silver Award for her Listen Reader, an experimental Magic Book that incorporated rich, controllable sound textures into each page of a real paper-based childrens� book. At Xerox PARC (1996 - 2002) she worked with the RED group exploring emerging genres and document types.